Sheppard Pratt has been improving quality of life for communities across Maryland for nearly two centuries. Thanks to the vision of our founder, Moses Sheppard, the patient-centered approach and compassionate care we provide today has been in place since we first opened our doors in the 1800s. 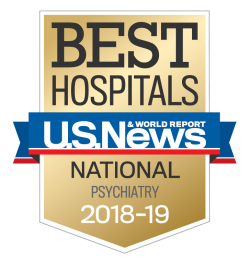 We take pride in the contributions we have made to the world of psychiatry, and we continue to be leaders in the field. The history of Sheppard Pratt begins with getting to know our founder, Moses Sheppard (1775 – 1857), a Baltimore merchant, Quaker, and member of the Religious Society of Friends. In 1793, Sheppard journeyed to Baltimore to become an errand boy in the store of John Mitchell. Mitchell quickly recognized his talents, and Sheppard was promoted to clerk; within three years, they formed the partnership of Mitchell and Sheppard. The store prospered, and by 1816, Mitchell retired. Sheppard worked hard and steadily grew the business, amassing a substantial financial estate. In addition to the store, he added a counting house, a twine manufacturing company, and a tobacco warehouse. Sheppard had a deep concern for social justice, which manifested itself in many ways. He served as the Commissioner of the Baltimore City Jail, where he saw firsthand the sad treatment of the incarcerated mentally ill. In addition to his work at the City Jail, Sheppard involved himself in the Abolitionist movement; he saw the movement as a peaceful solution to the issue of slavery. Sheppard was not alone in his desire to improve conditions for, and treatment of, individuals with mental illness. In the early 1800s, changes began in Europe and slowly made their way to America. Dorothea Dix, a prominent social reformer and nurse, was leading the reform movement in the Northeast, and she spearheaded the construction of humane treatment institutions for the mentally ill along the East coast. Knowing Sheppard’s background and his influence, Dix approached him to petition the Maryland legislature to fund a state mental institution. Sheppard was inspired by what Dix had accomplished in other states, but rather than champion a state-run institution, he put forth the idea of an asylum that was run privately and was not-for-profit. He envisioned an institution that would feel more like a home than a prison, that would treat patients with respect and dignity, and that would be surrounded by lush greenery that each patient could see from the windows that were present in all rooms. He wanted it to have recreational space, living quarters for doctors and staff, libraries, parlors, a chapel, and more. He wanted to leave a legacy, so instead of asking the state for funds, Sheppard petitioned the Maryland General Assembly for a private charter to establish The Sheppard Asylum that would be built according to his vision. 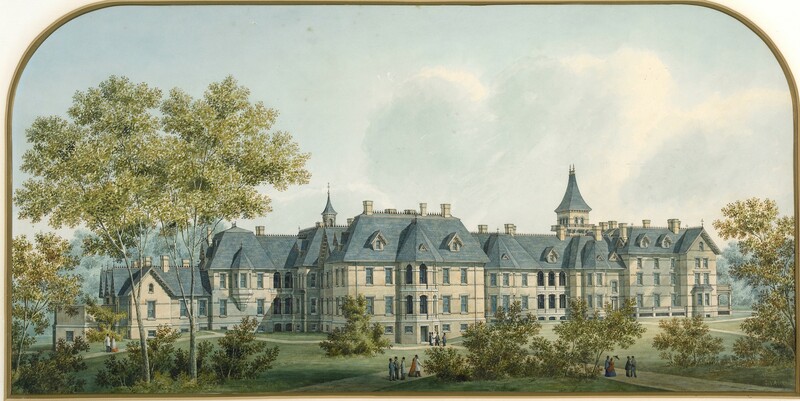 His charter was granted in 1853, and upon his death in 1857, Sheppard left his entire fortune to the building of The Sheppard Asylum. His gift of $571,441.41 was the largest bequest ever made to mental health at that time. The trustees of Sheppard’s estate followed his wishes. They called upon renowned architect Calvert Vaux to design the original buildings in accordance with the Kirkbride Plan. This was an architectural approach inspired by physician Thomas S. Kirkbride that maximized patient exposure to natural light, which was in accordance with Sheppard’s wish that all patients have sunlight. Due to the financial requirements of such a large structure, as well as labor complications of the Civil War, building the hospital took decades to complete. It consisted of many projects in addition to constructing the asylum itself, including The Gatehouse, the hallmark cottage at the Charles Street entrance to the campus. Finally, after 34 years of construction, on December 6, 1891, The Sheppard Asylum opened its doors, in Towson, MD, on a 340-acre campus where it still stands today. According to Dr. Edward Brush, the first director of the Asylum, it felt like a hotel with grounds like a park. In that first year, The Sheppard Asylum treated 53 patients. Moses Sheppard’s vision was shared by Enoch Pratt, a local merchant and philanthropist. He admired what was happening at The Sheppard Asylum, as well as how the Trustees were honoring Moses Sheppard’s wishes. Upon his death in 1896, he left a two million dollar endowment for The Sheppard Asylum. Pratt mandated that his bequest be used to complete any construction in progress, enlarge the facility to house 200 additional patients, and serve the indigent. He also asked that the name change to “The Sheppard and Enoch Pratt Hospital.” These conditions were met, and The Sheppard and Enoch Pratt Hospital continued to operate under the direction of Dr. Edward Brush following the principles instilled by its founders. As the hospital grew, it also focused more on providing meaningful treatment rather than mere custodial care; expansions included laboratories for research and libraries for learning. By 1904, annual admissions increased to 100 patients, having a variety of diagnoses. The hospital environment was said to be structured and disciplined, with privacy a top priority, something that is still respected to this day. Patients enjoyed many activities as components of their treatment, including golf, shuffleboard, lectures, and music. As admissions increased, many young doctors who wanted to study psychiatry came to the hospital to learn, as there was no formal training for mental illness at the time. The hospital prided itself on becoming a leader in the teaching field. It soon became clear that nurses were a crucial aspect of psychiatric care, especially since patient care and compassion were core principles of the hospital. With quality nursing care hard to find, in 1905, a specialized psychiatric nursing school was created at the Sheppard and Enoch Pratt Hospital. Doctors from nearby Johns Hopkins and the University of Maryland helped support the robust nursing curriculum. Expansion continued; leadership believed that patients needed additional therapeutic options. The hospital continuously increased its offerings, including building The Casino, a recreational building designed to lure patients out of their rooms. The Casino, a building constructed solely to house recreational offerings, was built as part of a growing occupational therapy program, a phrase coined by one of the hospital’s own doctors. It included a bowling alley, billiards area, reading room, and a gymnasium. Sheppard Pratt is renowned as the birthplace of modern occupational therapy, a practice founded at Sheppard Pratt by Dr. William Rush Dunton. Dr. Dunton believed that participation in activities and daily living tasks could restore individuals’ level of functioning. 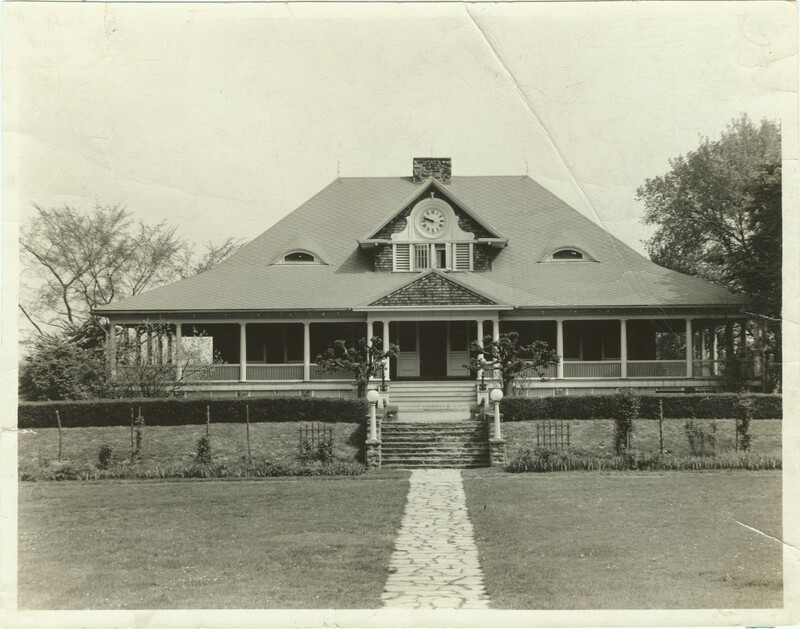 Early occupational therapy at Sheppard Pratt took place in the Casino, and involved participating in work tasks such as farming and gardening on the hospital grounds, as well as engaging in leisure activities such as art, dance, sports, picnics, and music. Sheppard Pratt was also the home to occupational therapy education, and training and classes were offered from 1922 – 1932. The hospital continued to grow, and by the 20th anniversary of the hospital, 2,369 patients had received compassionate care. A typical day consisted of reading, exercise, carpentry, occupational therapy, walks on the lawn, crafts, clinical observation, tonic baths, and conversations. Hospital staff believed that active patients were healthy patients. More rooms were built to accommodate the swift growth. Over the years, the hospital faced challenges, especially during wartime. During WWI, the hospital lost considerable staff to the war, but The Sheppard and Enoch Pratt Hospital always managed to overcome difficulties. Leadership thrived, making changes as needed, and always stayed true to the mission of Sheppard and Pratt. In 1919, Dr. Brush resigned as president, and Dr. Ross Chapman took the helm in 1920. He believed that the hospital’s role was to treat patients, conduct research, and provide education on all phases of mental health. He also felt that families should be included in a patient’s treatment. Dr. Chapman brought individual psychotherapy to the hospital’s treatment program, and by 1920, the Sheppard and Enoch Pratt Hospital was recognized as a leader in hospital psychoanalysis. As the country faced the Great Depression, the hospital continued to treat patients with new and innovative techniques. Electroconvulsive therapy was introduced during this period, and drug therapies began to gain favor. Once again, wartime was difficult for the hospital, but the Sheppard and Enoch Pratt Hospital stayed true to its mission with student nurses and doctors working long hours to help patients heal. Following the War, closed areas reopened. When our military personnel returned home, our country first noticed the need for treating service-related psychiatric disabilities, and the government was willing to spend money to take care of its heroes. Dr. Chapman understood there would be a need for more psychiatrists and psychiatric services. Trying to meet the need for additional staff, the hospital moved forward with an expanded training program for doctors and nurses, as well as allowing its staff to live off campus for the first time. Dr. Chapman led the hospital successfully, but died in 1948. In 1949, Dr. Harry Murdock took over as Medical Director. Dr. Murdock believed in maintaining the hospital’s reputation as a leading psychiatric teaching hospital. He also increased the use of social workers in patient care. Another area where The Sheppard and Enoch Pratt Hospital was at the forefront of psychiatric care was understanding that there was a need to provide specialized care for certain age groups, including children and the elderly. In 1958, a Child Guidance Clinic began operations, seeing anywhere from two to 10 adolescents at a time. Although many did not feel that psychiatric hospitals were appropriate facilities for children, hospital administration believed these complex cases needed care that could only be provided by trained psychiatrists. Dr. Gibson, who took over as Director in 1965, believed that the elderly deserved equal treatment when it came to their mental health. He was a leader in the field, advocating that Medicare should cover mental health treatments just as it did physical health. Facing wartime conditions once again during the 1960s, the administration knew it needed to continue being progressive. Keeping with Sheppard’s mission of providing compassionate care, they published “Information for Relatives and Friends of Patients.” The hospital administration understood that families played a key role in the care of their loved ones, and that mental illness was often misunderstood. Providing information such as this was a first step in the hospital understanding that marketing, fundraising, and consumer information were necessary in the psychiatric healthcare arena. Under Dr. Gibson’s leadership, the focus of Sheppard became treatment, research, and outpatient care. A Department of Research was established in 1968. Learn more about the research conducted at Sheppard Pratt today. Continuing their legacy as leaders in the field, Sheppard began to offer community outreach programs in the 1970s, including drug abuse and prevention programs, as well as a crisis intervention clinic. The clinic provided short-term treatment for patients needing immediate care. It was open 24 hours a day, seven days a week, meeting needs that would otherwise not be met. These outreach programs received the American Psychiatric Association’s 1972 Gold Achievement Award for demonstrating how, through innovation, a private hospital could be a catalyst for enhancing community services. Day treatment programs began at the hospital in the 1960s, and were a component of the services offered on the inpatient units. Some patients who did not need the full inpatient milieu received treatment for six to eight hours each day, and would return home at night. This was the beginning of what would become a robust “day treatment program.” The Sheppard and Enoch Pratt Hospital opened its first official day hospital in 1977, with the opening of the Adult Day Hospital. An Adolescent Day Hospital opened in 1992. As of today, SPHS operates several day hospitals across its campuses. Education for students with special needs was another area of focus and expansion for the health system. In 1978, The Mt. Airy School and The Bliss and Laverne Forbush Center therapeutic program joined, forming The Forbush School on the Towson campus. The Forbush School provided elementary, middle, and high school instruction to child and adolescent inpatients. While this first school only provided educational services to inpatients, the health system later shifted its focus, and began operating schools year-round. As of today, Sheppard Pratt operates 15 residential and day schools throughout Maryland, serving students with emotional disabilities, autism spectrum disorder, and related disabilities. In 1991, Dr. Gibson retired after 28 years of service to Sheppard Pratt. Dr. Steven Sharfstein took over as the fifth leader of the hospital. The administration quickly realized that changes were needed in how psychiatric care was provided. Long inpatient stays were common in the past; in the 1980s, the average length of stay at Sheppard Pratt was 80 days. However, long hospital stays were no longer an option with the increase of insurance requirements, managed care, and the deinstitutionalization movement. Managed care also brought about the need for increased reporting requirements, and with the shorter stays, emergency care became increasingly important. Aware of these concerns, Dr. Sharfstein took care to make necessary changes to keep the hospital current; in what seemed to be a counterintuitive move, he focused on expanding the hospital’s footprint and offerings throughout the state. The Board of Trustees voted to change the name of the hospital from The Sheppard and Enoch Pratt Hospital to the Sheppard Pratt Health System to reflect this expansion. In a strategic effort to create a community-based structure, Sheppard began acquiring affiliates in 1995, starting with Timonium-Dulaney Station. This was followed by the acquisition of Way Station of Frederick in 1997, and in 1998, Family Services Agency, Inc., of Montgomery County. With these acquisitions proving successful and widely beneficial for patients, North Baltimore Center (which would become Mosaic) was purchased in 2005, followed by Alliance, Inc. in 2012. These affiliates generally provided psychiatric rehabilitation and outpatient services, and helped increase the breadth of that Sheppard Pratt provided. Affiliate acquisitions were successful, but there was also a need to increase inpatient services. In 2002, Sheppard Pratt leased another hospital. Located in Ellicott City, MD, the hospital was a free-standing psychiatric campus formerly known as Taylor Manor. 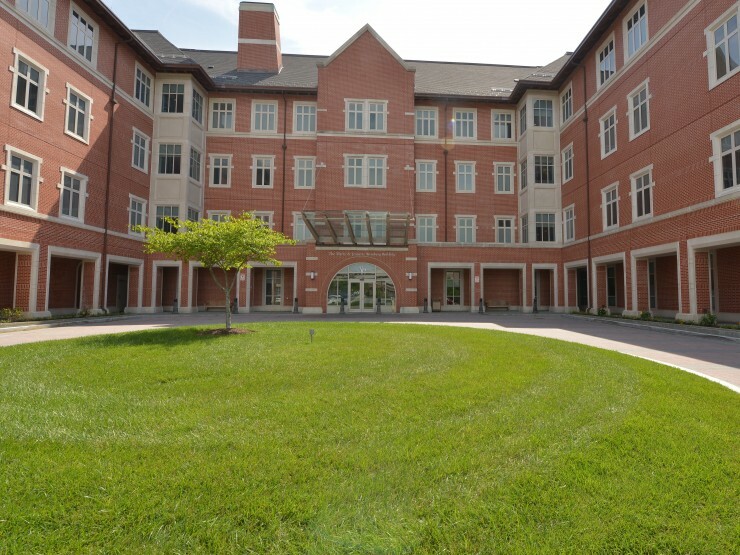 With the leasing of this campus, Sheppard Pratt was able to bring much-needed psychiatric offerings to Howard County, and increased the number of psychiatric inpatient beds in the state. In addition to expanding its footprint in Howard County, Sheppard Pratt strengthened partnerships with hospitals like Greater Baltimore Medical Center and The University of Maryland, providing expert psychiatric care to these centers. In 2000, Sheppard Pratt and GBMC entered into a Master Development Agreement. Sheppard Pratt sold part of its land to GBMC in order to raise money to renovate the hospital and build a brand new, state-of-the-art inpatient expansion. The hospital also received a large donation from The Weinberg Foundation. In 2005, the Weinberg Building opened on the Towson campus, with the exact principles that Moses Sheppard had in mind when he established the Sheppard Asylum – private rooms, windows, compassion, and comfort. Sheppard Pratt continued to expand, opening The Center for Eating Disorders in 2001. The Retreat, a self-pay, 16-bed residential program that helps fund nonprofit offerings for people without insurance, opened in June of 2002. The Neuropsychiatry Program was founded in 2011. Recently, Sheppard Pratt announced the purchase of 115 adolescent residential treatment beds, with the hope of opening a new facility with much-needed services in Baltimore County. And, in November 2016, Sheppard Pratt partnered with GBMC to bring mental health care directly into primary care practices. When a primary care physician notices a patient has symptoms of a behavioral health issue, instead of making a referral in the community, they can walk them right down the hall to link them with a Sheppard Pratt resource. As of October 11, 2018, Sheppard Pratt broke ground on a new campus in Howard County, MD, which will include an 85-bed, 156,000-square-foot hospital with inpatient, partial hospital, and crisis services. The campus will also include a 76,000-square-foot medical office building as well as two building pads for future expansion. In 2015, Dr. Sharfstein announced he would retire on July 1, 2016. In 2016, renowned physician executive Dr. Harsh K. Trivedi took over as the sixth President and Chief Executive Officer of Sheppard Pratt. Dr. Trivedi continues to uphold the values of the health system, leading with the same dedication, compassion, and thoughtful drive as those who preceded him. Today, we still uphold Moses Sheppard’s and Enoch Pratt’s visions of compassionate care for all.